Last modified on June 23rd, 2014 by Joe. This Java tutorial is to give an introduction to the Stream API which is one of the core features of Java 8. Pipelines and streams are introduced in Java SE 8 and it enriches the Java collections API. Java Stream API package is to support functional style operations such as map-reduce transformations on collections. At the heart of this package is “Stream”. Understanding Lambda expressions is a prerequisite to go through this Java Stream API tutorial. Stream is a sequence of elements supporting sequential and parallel aggregate operations. Stream is not a data type or a collection by itself. Sequence of elements are created out of a source, like a collection object, and transformed using different operations connected as pipelines and ends with a final operation. Source – is an entity that stores or generates data. For example, it can be a collection or a random number generator. 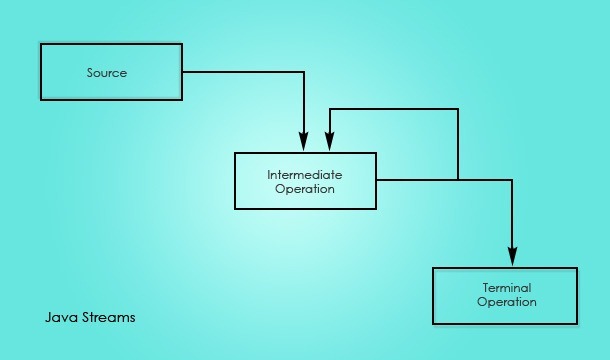 Operations – Intermediate and terminal are two types of operations in a stream. Intermediate operation returns a new stream and terminal operation consumes a stream. Stream – So the stream starts from a source and followed by one or more intermediate operations and ends with a terminal operation. Example Stream: following code prints strings greater than length 5 by iterating a collection. As stated above, Java stream operation are of two types intermediate and terminal. The intermediate operations are classified as stateful or stateless based on their ability to process elements independently. If each of the element can be processed independently without retaining any information for processing other elements, then they are stateless. If any information is retained for processing of other elements, then they are stateful. are stateless intermediate operations. Every individual element can be processed without the need for sharing information between them for processing. etc are known as stateful operations. Because elements cannot be processed individually, they need to be compared with one another thus requiring information to be retained. Terminal operations consumes the stream pipeline. It does not produce another stream like intermediate operations. It produces a result or a side-effect. Once the terminal operation completes execution, then the stream is completed and it cannot be used further. If there is a need to use similar stream, then a new stream should be created. This is similar to the concept of iteration using Iterable interface. Terminal operations are eager and intermediate steam operations are lazy. The intermediate operations just remain as a pipeline, and the elements are parse only when the terminal operation is executed. It is better since when there is a short-circuit the whole list of elements need not be processed, thus improving the performance. Execution of a code block in terminal operation is a side-effect. This should be used with care as it can affect the stateful nature of a intermediate operation. Operations like forEach() and peek() can only be executed using a side-effect. It can be useful for simple System.out.println for debugging small Java programs. The code block at the start of this tutorial is an example for side-effect. Both intermediate and terminal stream operations can do short-circuiting. If the source is an infinite one (for example, unlimited supply of random numbers), cutting it short to a finite list of elements by an intermediate operation is short-circuiting. When a terminal operation completes in final time even if the input from a stream is infinite, then it is short-circuiting. Short-circuiting is a necessary but not sufficient condition for an infinite source in a Java stream. Order of the elements processed in an operation depends on the source in a Java stream. For example, in a sequential stream for java.util.List the order will be maintained. But in the case of Map it need not be maintained. 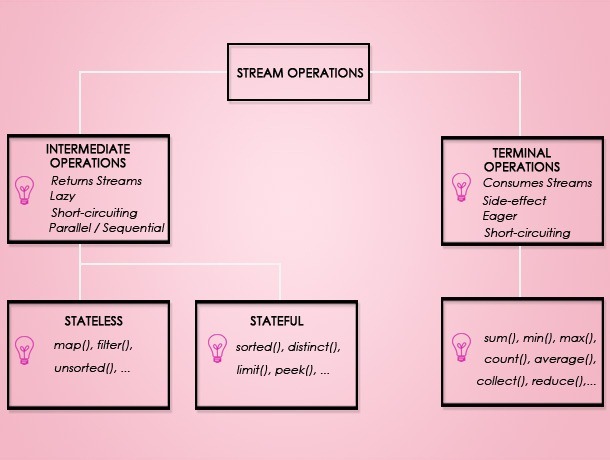 Following Java code example demonstrate the basic uses of streams. System.out.println("Average age of " + Animal.WILD + " animals: "
In the next Java tutorial, we will go to the next level in Java streams API. Comments on "Java Stream API"
Stateful Intermediate Operations, Stateless Intermediate Operations headings are interchanged. Pls change them. Hey thanks Harita. I have fixed it. Like your tutorials. This one has peek() listed as Stateful in the diagram but Stateless in the text. Which is it? Comments are closed for "Java Stream API".